I had to take this picture after dark so I used daylight bulbs. Still not the best light to see them in. Number one starts at the top left corner and then they go down the side with number ten being the third and last in the second column. The first two paintings I did on Raymar Art panels that were part of a sample pack. 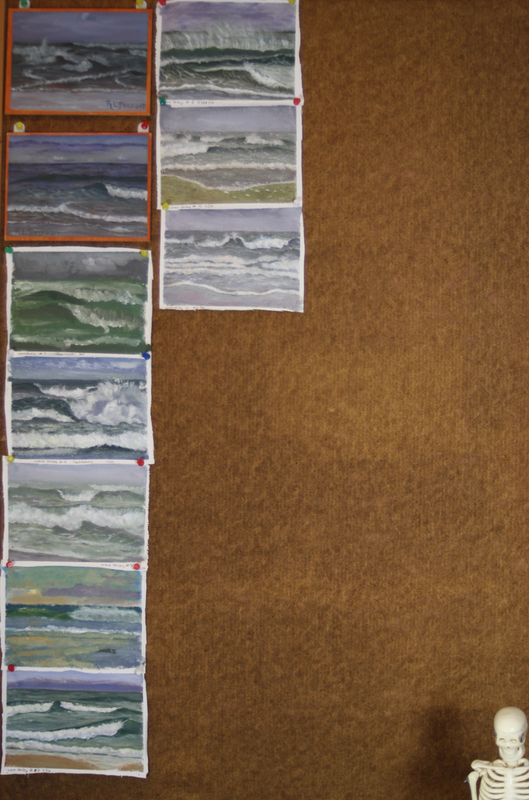 I had toned them with burnt sienna before I knew I was going to use them for wave studies. It is kind of hard to see them very well in this picture but it is fun to stop and take a break and study them. I learn a lot. They definitely look related and painted by the same person. I do try to vary the composition but I can see some tendencies starting to crop up. I will have to work on that. I don't want them all to look too much alike. Today I spent the day attending life drawing in the morning and then errands up north in the afternoon. I had hoped to find a pair of rubber boots to replace my nearly useless ones. Unfortunately I didn't find a pair. I don't mind spending a little extra money on quality that will last but I do mind spending a lot on something poorly made. I looked at the Bogs (in case you are reading Theresa) the only model they had in the store was made with neoprene on the upper. I need waterproof up to my calve. The runoff streams get deep in the wet weather and when the tide is high. I guess I will have to shop online. 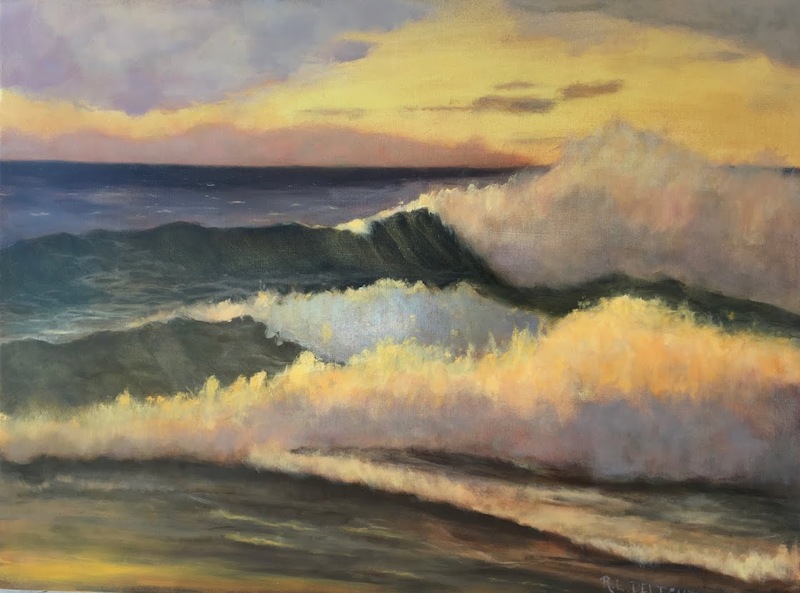 Since I am at a natural break in my wave study quest, I thought I would also take the time to make a quick mention of a few new painting tools. I have tried out the Rosemary & Co. brushes I ordered. I ordered the Ivory line of synthetic bristle brushes. I had very few flats or brights in my small brush arsenal so I ordered those. I have been using a few of them while painting the wave studies and I must say I like them the best so far of all the brushes I have tried. I have been trying different lines of synthetic brushes, usually ordering one of a different brand in the same size and shape in my quest to find a good fit and these might be it. I mostly use filberts so I will have to try the filberts out before I decide completely. On Wave Study number 10 I also tried using Cobra water miscible oil paints. I had tried them a year ago and didn't like them but I was just using water and I wasn't using the medium that is made to be used with them. I had purchased the medium some time ago but hadn't tried the paint again. I decided that it would really be nice not to have to take the more toxic OMS (odorless mineral spirits) out into nature so I gave the Cobra paints another try with the proper medium and water for clean up. I must say I am pleased. I really can't tell any difference in the way the painting looks and there was only a slight difference in paint handling. Tomorrow is a necessary day off to catch up on chores and take care of a few things. Of course, we have another storm moving in so if the weather is nice in the morning, I might not be able to resist going out to paint. The weather rules in this quest. I know there will always be a nice storm to give me a day off now and then! 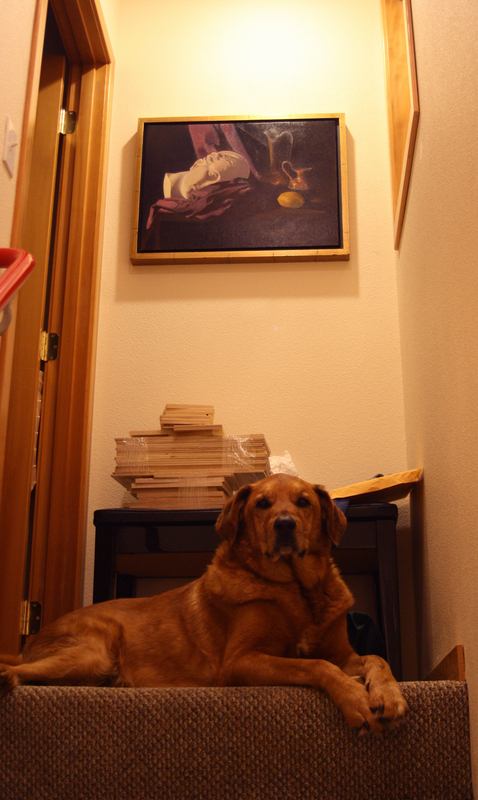 Here is a final parting shot of my dog Twill at the top of the stairs to my studio taken from the lower landing. She likes to follow me around and lay on my feet. It can be a bit challenging to work that way but at least I have warm feet. Now, on to the second set of 10! To the studies, hard to see all at once BUT I think my favorites are four, one and two in the long column in just that order. 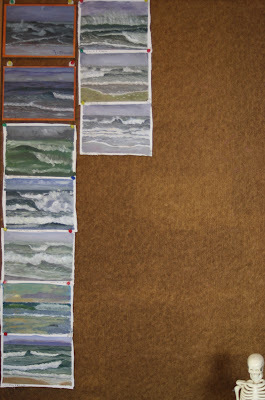 I did see that many wave studies had the wave break and roll at much the same point,and something in the center of many giving it a sameness even though we all know on close inspection it's not. The waves themselves look great though, believable and real with lots of motion i most. A fine to start to a lovely body of work. Don't stop!!! Theresa, what a lovely critique! Yes I was seeing the same thing you mentioned about the waves breaking at the same point. It seemed that no matter how much I tried to sketch a composition out before starting to paint, I ended up with the same thing. I will have to think about that and work on composition a bit more. I believe it is because I was trying so hard to get color and wave form right that composition got shoved to the bottom of the list. That makes me think, I believe I will list out the properties I need to focus on and assign each group of ten one of those properties and do my best to focus on it. That breaks it down into manageable pieces. Number 4 is one of my favorites too and is the one I want to do a finished painting of. It will be a challenge to keep the elements that make it dynamic and still give it a bit more polish. Oh this is so much fun! Don't worry, I won't be stopping. I really appreciate your comment. As for boots, I might just go with the bogs and see about adding a bit more waterproofing. Once I cross the streams I am standing in the cold wet for 3 hours and your point about the neoprene keeping you warm is well taken.